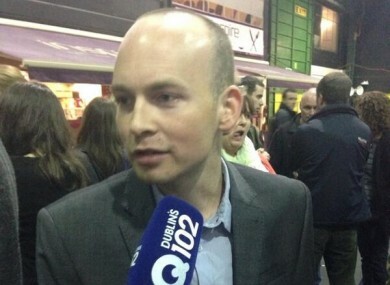 SOCIALIST PARTY MEP Paul Murphy and party leader Joe Higgins, have this evening criticised People Before Profit’s Brid Smith for splitting the vote in the European election as it becomes ever-clearer that Murphy will not retain his seat. In the first count last night, Murphy received 29,953 votes while Smith took 23,875. Sinn Féin’s Lynn Boylan swept ahead of all other candidates, receiving a whopping 83,264 votes in the first count. The socialist candidate was eliminated on the fourth count. When asked last night if he thought Smith had created problems for him by splitting the vote, Murphy said “I think, unfortunately, that’s a fact – that’s what the figures will demonstrate,” telling reporters he would have preferred it if the People Before Profit candidate hadn’t run. It’s clear that there was room here for one serious left MEP. I believe that we could have taken that seat or been very, very strongly contesting but when the vote is split it kind of denies you some momentum in the earlier stages of the campaign, say a month or so out. So, yes it was regrettable and shouldn’t have been done but now, as Paul indicated, we want to work with those on the left – genuine anti-austerity campaigners – to build the type of campaigns that are needed to protect the ordinary people from the ongoing ravages of austerity. Bríd Smith, on the otherhand, doesn’t think she’s to blame. “Well, see, I don’t think that even if you added my total and Paul’s total together, you’re looking at about 50,000, 52,000 votes, that would never have been enough to get Paul over the line and it certainly wouldn’t have been enough to, you know, win him a seat,” she said, speaking after the first count tonight. She said “nobody was going to overtake Sinn Féin today” and that’s the different factor in this election, “not Paul and Bríd”. Higgins has already said he will not be running in the next general election and Murphy indicated this will be his next move. “This is the beginning – not the end – for me, for the Socialist Party, for the left,” he said. Email “The gloves are off: Socialists slam Brid Smith for splitting Dublin vote”. Feedback on “The gloves are off: Socialists slam Brid Smith for splitting Dublin vote”.